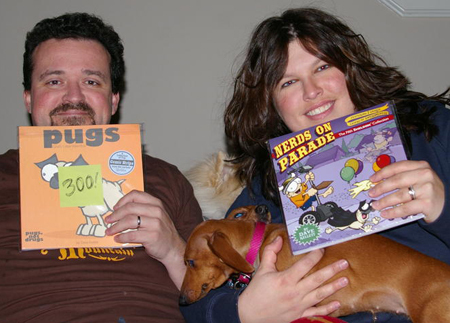 "Comic Artist Helps Newlyweds be Awesome on First Christmas"
I just wanted to send you an extra thanks. I had ordered an Artist Edition copy of both the most recent book and "Pugs". When the package showed up I saw the little sticky note on the Pugs book that said "300" and I got all fanboy excited. I have been giving your books to my wife as Christmas and Valentine gifts (we just got married on Dec 4th) since we were first dating [...] I had remembered that back on November 26th you had talked about how you had an extra special sketch in that one and I had thought to myself "Boy! It would be neat to get that." then promptly forgot about it until I saw that little sticky note with "300" on it. I peeked inside before I wrapped it and it _is_ awesome. I know she will be even more excited than I am when she gets it. I will send you a picture of her with the book after Christmas. So thanks again for a wonderful present and for making me look good on our first married Christmas. Making good on his promise, Andy sent in this photo, today. Thanks, Andy! Speaking of Artist Editions...there are only 21 Artist Edition copies of "Nerds on Parade" left, including that final #300 with the super-panoramic drawing in it! You can grab one of the remaining Artist Editions either by itself, or with the rest of the collection! And with luck, you'll snag that last one, and get #300 like Andy did!